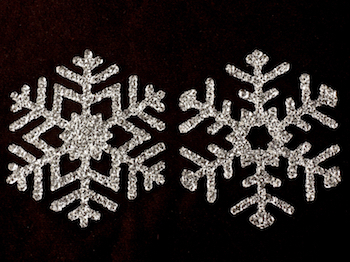 Create delicate, beautiful snowflakes - two at a time - with our Snowflakes '16. 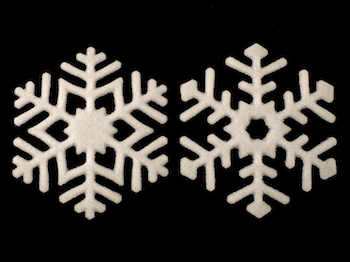 These are the largest of our snowflakes designs measuring 4.25 inches (11 cm) across. 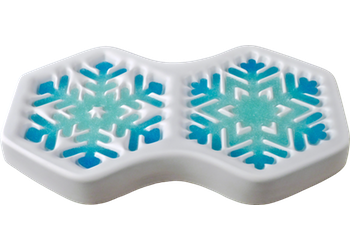 They are easy to make and great results can be had using clear frit. 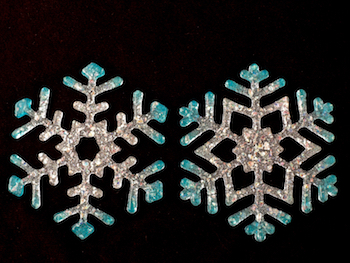 Of course the addition of dichroic frit or flakes, or colored frit adds to their uniqueness and beauty. 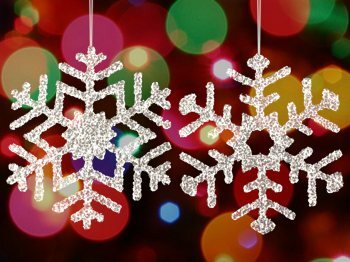 Finished snowflakes can be hung as winter and holiday decorations or fused to larger projects. We have complete firing instructions and a step-by-step video. Click on the green LEARN tab above to see both. The mold is 10 by 5.5 by 1.25 inches (25 by 14 by 3 cm). Each cavity holds 25 to 30 grams of frit. Best results can be had by using ZYP BN Aerosol.